*Please note, all games for Saturday have been moved to the Melissa Sports Complex due to weather concerns. Five Tool Futures officially kicks off 2019 this weekend, March 22-24. 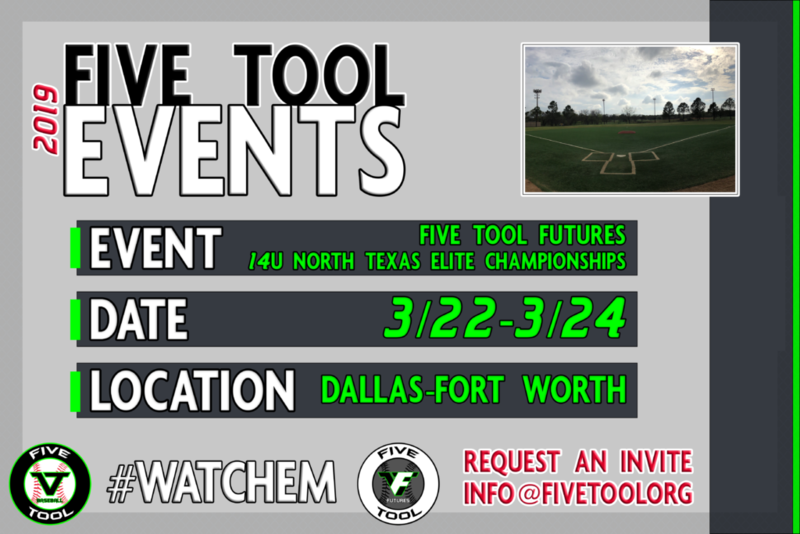 Five Tool has partnered with NTX Tournaments to help bring the Five Tool Futures 14U North Texas Elite Championships. This event will feature pool play games with single-elimination bracket play on Sunday to determine one winner. Click here to view the schedule for the weekend. The venues for the event will be Colleyville Heritage HS, L.D. Bell HS, Meadow Park Athletics Complex (PDC), and Trinity HS. You can find the addresses and directions to the events by clicking here. There will be a $5 gate fee and baseballs will be provided. Game time limits are two hours. You can follow the action on Twitter by checking out @VToolFutures. Games stories and Dudes of the Day for the event can be found by clicking here.